Amazing bottles , I could immediately see an Orthodox church influence. I am sorry you can no longer afford to collect. 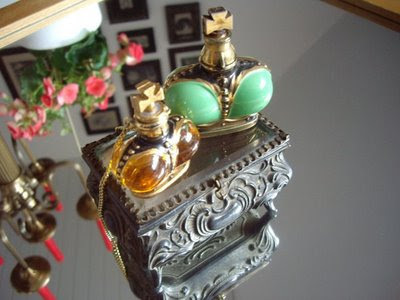 I know the feeling as my daughter has a book on perfume bottles and I just wouldn't know where to start. The same applies to clothes design from great houses I am crazy about vintage Lanvin and would love to collect. I was just wondering if you were familiar with any givaways that Prince Matchabelli had done in the past. I have a very sweet little bottle (miniature) encrusted in rhinestones that is in the shape of a Prince Matchabelli bottle..